Bannon, meanwhile, risked contempt by not answering questions from a House intelligence committee. STEVE BANNON, THE combative former chief strategist for US President Donald Trump, was interrogated for 20 hours over two days this week as part of special counsel Robert Mueller’s Russia investigation, according to a person familiar with the process. The person, who declined to be named because they were not authorised to publicly discuss the investigation, said Bannon answered every question that was put to him by Mueller’s team. That’s in contrast to an interview yesterday with the House intelligence committee, where Bannon declined to answer some of lawmakers’ questions, despite a subpoena. While the exact questions for Bannon are unknown, Mueller is investigating whether there was any coordination between Trump’s campaign and Russians who meddled in the 2016 election, and also whether there have been any efforts to obstruct the ongoing FBI probe into those contacts. The House panel is investigating the meddling and whether Trump’s campaign was involved. Because Bannon was one of Trump’s top advisers, both Mueller and the lawmakers were expected to question him about key events during his time in the White House, including Trump’s firings of former national security adviser Michael Flynn and former FBI Director James Comey. After Bannon’s roughly three-hour interview on Capitol Hill, Republicans on the House intelligence panel were weighing whether to hold him in contempt. Like his first visit to the House intelligence committee in January, Bannon declined to answer questions in the closed-door session. According to lawmakers of both parties, Bannon would only answer 25 questions that had been pre-approved by the White House when asked about any events in the time period after President Donald Trump’s election. His answer to each question was “no” and he told the committee he was not authorised to elaborate. Bannon was already under subpoena as lawmakers on both sides of the aisle have been critical of the White House’s sweeping interpretation of executive privilege and its contention that pretty much everything is off-limits until the president says it’s not. The escalating fight between Congress and the White House over the privilege issue has centered around Bannon, an outsized figure in Trump’s campaign and White House and an inspiration to some conservatives as he has publicly battled the Republican establishment. He was fired from the White House last summer, and more recently had a falling out with Trump after the January publication of a book in which he sharply criticised Trump family members. Despite his fractured relationship with Trump, Bannon has followed White House direction as the House lawmakers have sought to talk to him. At issue is whether Bannon can talk about the presidential transition, his time at the White House and communications with Trump and others since he left last summer. Texas Representative Mike Conaway, the Republican leading the panel’s Russia probe, said Bannon would only answer the pre-approved questions about any time period past the day Trump was elected in November 2016. 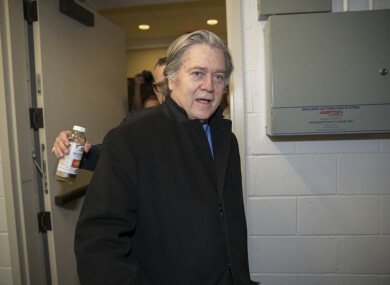 He said committee Republicans would discuss whether to hold Bannon in contempt with House lawyers and with House Speaker Paul Ryan, who is likely to have the final say. “That’s an ongoing conversation we’ll have among an awful lot of lawyers,” Conaway said after Bannon’s interview. At least one Republican on the intelligence panel said before the interview that a contempt vote would be necessary if Bannon were uncooperative. Florida Representative Tom Rooney said on Tuesday that if Bannon didn’t cooperate with the panel and they didn’t hold him in contempt, that would set a bad precedent. Democrats are pushing for a contempt vote, with the top Democrat on the intelligence panel, California Representative Adam Schiff, saying he believed Bannon’s non-answers were all an attempt to draw out and block the Russia probe. Negotiations between the House and White House have been ongoing since Bannon’s first interview, and several interviews have been scheduled and postponed in recent weeks. Lawmakers headed into the meeting ahead of Bannon’s entrance appeared unsure if he would arrive. Bannon is one of the committee’s few remaining witnesses in its Russia probe, which Republicans on the panel have said they want to wrap up early this year. The Senate intelligence committee is running a separate investigation into the Russian meddling. The Senate panel hasn’t yet spoken to Bannon, according to a source familiar with the probe. The person declined to be named because the interview schedule isn’t public. Email “Steve Bannon 'answered every question' in 20-hour interrogation on Trump-Russia links”. Feedback on “Steve Bannon 'answered every question' in 20-hour interrogation on Trump-Russia links”.